This leather dog leash is 4mm thick! The 2~3mm thin leather leash also tends to crack or split easily under normal wear and tear. Our leash is strong enough for the heaviest of dogs, also suitable for smaller puppies and breeds. We don't want your furry friend break away. We guarantee the quality of our products, but sometimes because of the different display color factors and shooting when ambient light and other factors, so in a sense of color and material will be slightly different , We hope you can understand. The size was manual measured, there will be small little error, kindly note. REAL GENUINE LEATHER dog leash is real US imported leather, assembled and accomplished in China. Has the original authentic flavor and modern fashion style. handmade, tensile resistance is strong, durable. ALLOY CASTING METAL CLIPS Simple and practical, strong tensile resistance can carry 500 Lb pull force, it is easy to clips on and off the collars or harness. PROFESSIONAL GRADE Can be used for military dog training. 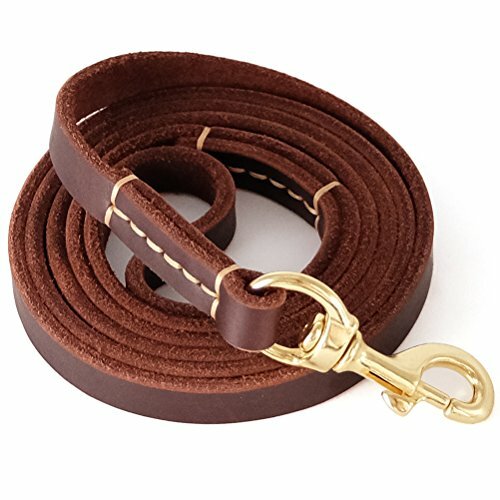 This leather dog leash suitable for small to medium dogs such as Yorkshire Terrier, Chihuahua, Pomeranian, Teddy... and so on. BEAUTIFUL AND COMFORTABLE Resists water & stains with minimal care, yet feels supple and won't tear at your hands or collect hair like nylon leashes when training, walking or running with your pet. 2 year warranties service, 60 day unconditional return. we also can offer the real leather dog collar, which can match the leash more perfectly. If you have any questions about this product by Fairwin, contact us by completing and submitting the form below. If you are looking for a specif part number, please include it with your message.